After Decades of Chinese Imports, How to Revive American Manufacturing? Industrial innovation has slowed down in the United States mainly because of imports from China, according to a recent study. The findings of the study support President-elect Donald Trump’s negative stance on free trade and globalization. But can Trump’s tougher trade policies alone help bring innovation back to the United States? The report published by the National Bureau of Economic Research shows that imports from China increased competition and therefore hampered industrial innovation in the United States over the past two decades. The scholars measured innovation by looking at the number of patent applications by U.S.-based manufacturers. “Our results suggest that the China trade shock reduces firm profitability in U.S. manufacturing, leading firms to contract operations along multiple margins of activity, including innovation,” stated the authors of the report, economists David Autor from MIT, David Dorn from the University of Zurich, Gordon Hanson from the University of California–San Diego, and Pian Shu and Gary Pisano from Harvard Business School. The analysis starts with data from 1991, when the Chinese imports began to grow in earnest. Imports accelerated after the country’s accession to the World Trade Organization in 2001. Rising import exposure also reduced employment, revenue, available capital, market valuation, and research and development (R&D) expenditure at U.S. firms, according to the report. 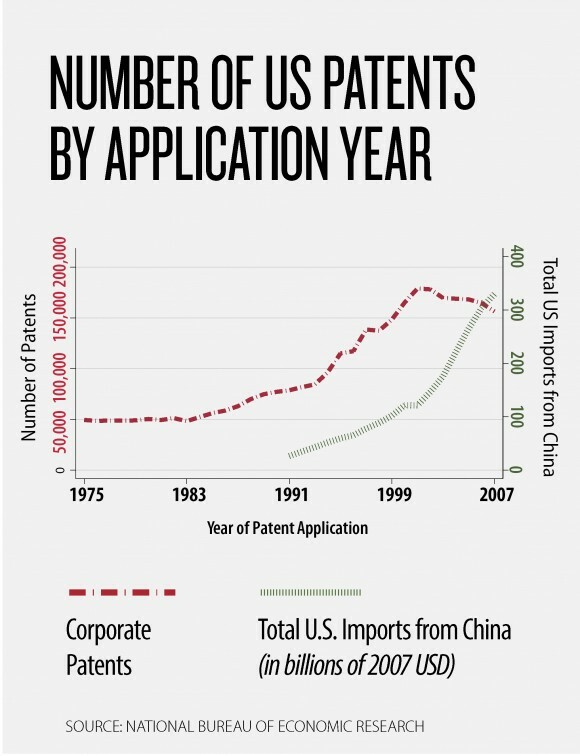 The study mentions the difference between the United States’ and Europe’s responses to the China trade shock; namely, European firms created more patents and expanded investment in R&D and technology to tackle the import competition from China. “The emphasis on shareholder value that Wall Street and investors have infused into manufacturing and other sectors of the economy has some dire consequences for U.S. firms investing in research and development,” said Scott Paul, president of Alliance for American Manufacturing, a nonprofit organization formed by manufacturers and the labor union United Steelworkers. U.S. companies had to outsource manufacturing operations to cut the costs and return more value to shareholders. The business mindset in the United States has to change, according to Paul. “I wish the new report would convince corporate boards or executives about the need to invest in innovation, but the pressure of the financial markets is too much to overcome,” Paul said. 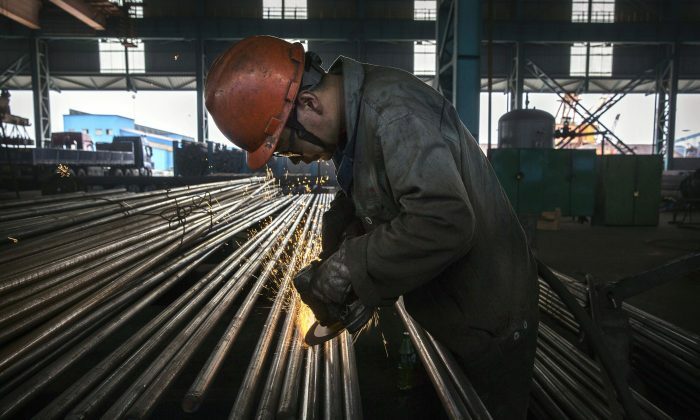 More than 63,000 factories have closed and 3.2 million jobs lost in the United States since China joined the WTO, according to the Alliance for American Manufacturing. To bring manufacturing and innovation back to the United States, the Trump administration needs to use trade policy, tax reform, and incentives, experts say. China uses currency manipulation and other unfair practices to gain a trade advantage and weaken the competitiveness of U.S. products. As a response, Trump intends to use countervailing tariffs to persuade China and other countries to play by the rules. “The current administration has tried to use persuasion with the Chinese government. That has failed. The Trump administration, I believe, will move beyond persuasion to actual consequences,” said Rob Atkinson, president of the Information Technology and Innovation Foundation (ITIF), a U.S. think tank that focuses on technology innovation. In addition to currency manipulation, the Chinese government subsidizes its industries. A good example is the clean energy industry, according to Atkinson. “In solar and wind energy, the United States was much more innovative than China. However, the Chinese government maximally subsidized these two industries. So it made it difficult for the U.S. wind and solar companies to make an adequate return. They ended up cutting their R&D spending and became less innovative,” he said. According to Atkinson, Chinese policies don’t just hurt American companies, but damage and hinder the rate of global innovation. Technology industries in Europe, Japan, and the United States have been hurt by unfair Chinese policies, so any trade policy against China should include collaboration with partners in Europe and Japan. Otherwise, U.S. companies may face retaliation by China alone. “The trade policy can succeed if it is a multilateral policy where we engage our partners in Europe, particularly Germany, and Japan,” Atkinson said. Also, Trump intends to reduce both individual and corporate taxes. According to experts, a corporate tax code that is globally competitive may bring jobs and manufacturing back to the United States. “Putting more money in the pockets of U.S. consumers [through tax reform] could be helpful to manufacturing,” Paul said. After World War II, the United States was the first country to prioritize R&D. At the time, the federal government accounted for over 50 percent of public and private R&D. Today, however, it accounts for only 8 percent, according to a report by ITIF and Brookings Institute. The Obama administration took some steps to improve the situation by launching a national network for manufacturers called Manufacturing USA. It established institutes to promote manufacturing innovation, education, and collaboration. “Manufacturing USA is an important program to help manufacturers do cooperative research on technologies like 3-D printing or lightweight materials. The new administration needs to continue and expand that program,” Atkinson said.